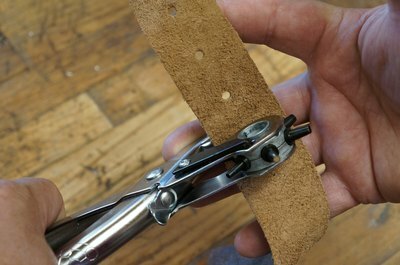 Cleanly cut holes set your leather craft projects apart from leatherwork with ill-defined piercings. There are two approaches to punching clean holes in leather. Pliers-style punches are convenient and easy when it comes to making small holes, but they don’t offer the ability to create dies with large diameters. Punches using a strike method work better for creating holes with larger diameters and also for creating small holes in extremely thick or tough leather. 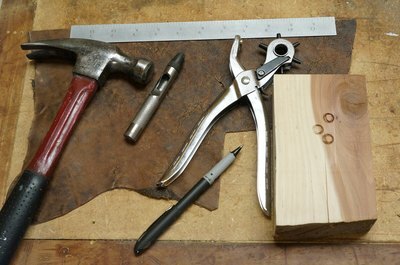 Leatherworking tools can be found in most craft stores, specialty leatherwork stores and online. Please see the last slide for an itemized list of tools and materials. Carefully measure and mark the position of your holes. Mark large diameter holes with a “crosshairs” pattern and position the die centered on the crosshairs. 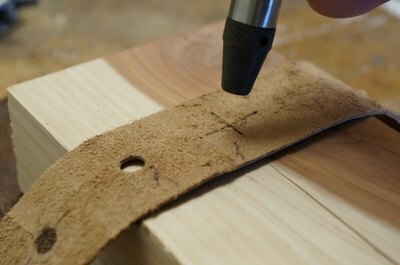 Smaller holes can be marked simply with a dot. Standard Punch Position the leather on a block of scrap wood. Place your punch exactly where you want the hole. Strike the punch, driving it through the leather. Revolving Punch Select the correct size die. Locate the die over the mark and squeeze the handles. Depending on the thickness and density of your leather, it may take both hands to punch all the way through. Struck dies are available in fixed and interchangeable styles. Fixed dies are the strongest and longest lasting, while interchangeable die sets are economical for occasional users.